Welcome to the official website of Drew Collins and Drew Collins Motorsports (CA Motorsports). Drew currently resides out of Auburn, Georgia and competes in the Dirt Late Model ranks across the Southeast in his familiar #D5. In 2018 Drew captured the Southeastern Late Model Sportsman Series Championship. In 2016 Drew became the Hartwell Speedway Limited Late Model Champion winning his first career Dirt Late Model championship. Along with that outstanding accomplishment Drew was able to take home nine wins within the 2016 season. 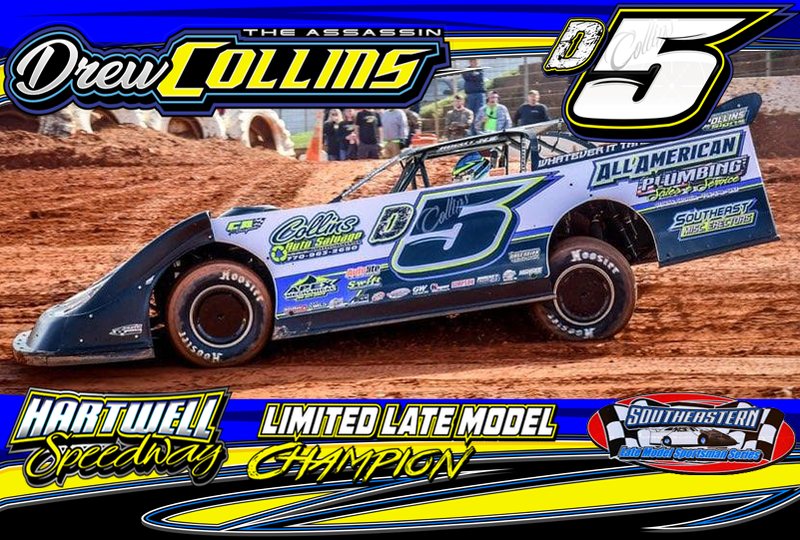 Current sponsors include: Collins Auto Salvage, All American Plumbing Sales & Service, Apex Mechanical, Southeast Misc. Erectors, It's An Obsession Photography, A Rob Performance Parts & Fuel, Autolite By Bryan Crawford, United Insurance Company, Collins Signs, Thomas Clarke Performance, Swift Springs, and Rocket Chassis.